Strategically located along the Gulf of Guinea and atop enormous high quality oil reserves, the three Nigerian states of Delta, Bayelsa and Rivers – commonly referred to as the Niger Delta – have been plagued with armed groups and insurgents for decades. 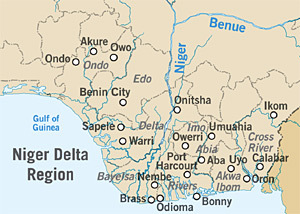 Although its tremendous resource wealth should make the Delta one of Western Africa’s most prosperous regions, decades of neglect by the Nigerian government, widespread corruption, and the environmental damage caused by the MNCs operating in the region has alienated and marginalized the local population and allowed armed groups to proliferate.1 Compensation paid out by the MNCs for appropriated and polluted land has led to inter-communal and inter-ethnic violence, most notably between the Ijaws and the Itsekiris in the Warri area of Delta State.2 Since the discovery of oil in the Delta, this type of ethnic conflict has been driven primarily by the desire to control resources along disputed community borders. Beyond legitimate concerns for human rights, the United States has clear strategic interests in a stable Niger Delta. In the run up to national elections in 2007, militancy was at fever pitch and the combination of theft and sabotage reduced oil industry output by 25-35% of capacity. Despite the clear instability of the Delta, Nigeria continued to rank 15th in global oil output in 2008, and was the 5th largest supplier of oil to the US.6 As attacks on the local oil industry have caused clear spikes in the worldwide price of crude, a steady and secure supply from the Delta would go a long way towards stabilizing the global market, helping to wean the United States from its reliance on Middle Eastern imports, and enhancing energy security. Niger Delta Strike Force (NDSF) – Operating under the MEND umbrella in Rivers State, the NDSF is sometimes referred to as Eastern MEND. The NDSF was formed in 2005 by Farah Dagogo, a former independent commander of a separate militant organization. Initially the NDSF developed a close partnership with the Outlaw’s Soboma George. By 2008, however, the two groups had become sworn enemies while remaining nominally linked through their association with MEND. Niger Delta People’s Volunteer Force (NDPVF) – Founded by Mujahid Dokubo-Asari and operating mostly in Rivers State, the NDVP broke from the more politically mainstream activist Ijaw Youth Council (IYC) in 2004 and threatened an all-out war on the oil industry. The threat of guerilla operations aimed at the disruption of oil production caused a spike in global oil prices to a then-high of $50 a barrel. Asari’s arrest in 2005 by the Nigerian government on treason charges played a key role in the formation of MEND, though his release in 2007 did not lead to the NDPVF joining the umbrella organization. Asari openly admits to funding his group through the sale of stolen oil, claiming that he is just taking back what has been stolen from the Ijaw people.11 Members of the Reformed NDPVF participate in the Joint Revolutionary Council (JRC) along with members of MEND and a group known as the Martyrs Brigade. People’s Liberation Force (PLF) – Led by Egbiri Papa, also known as Soboma Jackrich. Sometimes allied with Dagogo’s NDSF. It did not take long for skeptics of the plan’s success to be vindicated, however, and only a month after the amnesty came into force, Ateke Tom had become publicly impatient about the pace of job growth in the region and was threatening a resumption of hostilities.15 While violence remained low, kidnappings, oil bunkering, and other incidents did not disappear completely. Although some aspects of the amnesty and rehabilitation program have continued to move ahead, the continued absence of Yar’Adua and promotion of Vice President Goodluck Jonathan to Acting President in mid-February led to more instability. Although Jonathan hails from the Delta, is the former Governor of Bayelsa State, and is thought to have had close ties to MEND at one point, militants in the Delta declared his assumption of power illegal and promised to continue attacks.19 While Yar’Adua returned to the country in the dead of night on February 24, observers are still unsure who is actually wielding power in Nigeria, a fact that will no doubt lead to continued militancy in the Delta in the coming months. As recent months have shown, Nigeria’s unstable political system has the ability to fuel and drive militancy in the Delta. Elections pose a unique threat to regional stability, and although the next national elections are not until April 2011, there has been a tendency in Nigeria for violence to emerge in the year leading up to the vote, as militants are hired by political parties to intimidate opponents and mobilize votes. Even more troubling will be the elections of 2015, when the presidency is expected to be rotated to another geopolitical zone of the country. Augustine Ikelegbe, “The Economy of Conflict in the Oil Rich Niger Delta Region of Nigeria” Nordic Journal of African Studies 14(2), 2005. Ikelegbe, 220. United Nations Office on Drugs and Crime, “Transnational Trafficking and the Rule of Law in West Africa: A Threat Assessment”, July 2009. United States Institute of Peace, “Special Report: Blood Oil in the Niger Delta”, August 2009. William Rosenau … [et al.] “Corporations and Counterinsurgency”, Rand Corporation Occasional Papers, 2009. 10. Judith Burdin Asuni, “Understanding the Armed Groups of the Niger Delta”, Council on Foreign Relations, September 2009. This is not meant to be an exhaustive list, and there is an array of smaller groups not discussed in this backgrounder. United Nations Office on Drugs and Crime, Transnational Trafficking and the Rule of Law in West Africa: A Threat Assessment, July 2009. Emma Amaize, “Group Breaks Away From MEND”, Vanguard, February 14, 2010. Adam Nossiter, “Poverty Could Imperil Amnesty in Niger Delta, New York Times, November 26, 2009. Sola Adebayo, “Yar’Adua’s Illness Stalls Post-Amnesty Programmes” Punch, November 30, 2009. Emma Amaize, “MEND breaks ceasefire rule, attacks Shell/Chevron pipeline”, Vanguard, December 19, 2009. Dulue Mbachu, “Nigerian Rebels End Delta Cease-Fire, Will Resume Oil Attacks” Bloomberg, January 30, 2010. “Niger Delta militants say Nigeria’s acting president is illegal” The Daily Maverick, February 11, 2010. Thomas Strause, “Will Nigeria’s Amnesty Campaign Have a Lasting Impact on the Delta Insurgency?”, Jamestown Foundation Terrorism Monitor, October 30, 2009. This entry was posted in Backgrounders, Niger Delta, Past Student Work and tagged West Africa by Administrator. Bookmark the permalink.